In Eph. 6 Paul said our struggle is not against flesh and blood, which means we are not fighting flesh and blood as Christians. In fact, loving our enemies is the spiritual warfare we are to use, for in doing so we fight the real enemy, the hatred that overtakes them (and us if we reject our call). God told us this would look foolish, even offensive, to the world. But Boyd takes an interesting turn, advocating that though Christians must be nonviolent, we must understand that it is the world’s place to take another path. The reason why is that the covenant we have made with God the world has not made. 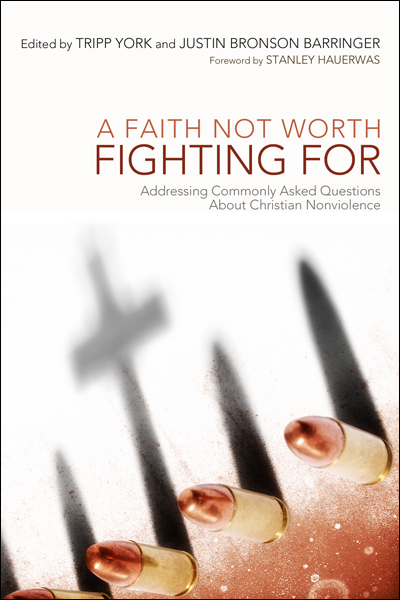 The world is not transformed enough to celebrate Christian nonviolence on its own terms. We cannot expect the world to operate according to a covenant only some have made. The Bible’s virtues are not taught just so that people can be good, but because God is good, and we are to be like him. If the world is under Satan’s rule (Luke 4:5-7; Rev. 11:15), why would we expect this from those who haven’t been transformed by Christ? Another chapter will deal with Romans 13, but Boyd points to a common misunderstanding of the verse. The verse isn’t saying that kingdoms are conforming to God’s will, or that he approves of their actions. It say that he “puts them in their place” (the verb tasso). “Since these governments rely on the power of the sword,” says Boyd, “God steers their sword-wielding activity to justly punish wrongdoers.” Earth kingdoms are rebellious and therefore choose force. However, God is so powerful he can even use their rebellious nature to preserve justice. Perhaps an illustration would be God using a thief to rob a rich man who cheated the poor. God does not approve of thievery, but he may have moved through the thieves actions, just as Joseph’s brothers did evil to him, but God meant it for good. When God punished Israel through Babylon, he was not approving of Babylon, just using them. This is not to say that Christians’ can’t influence the world toward nonviolence. We are called to “get in the way of violence,” which is what being a peacemaker is. A peacekeeper only keeps violence and tension at bay, and ignores the underlying conflicts. He keeps two men from killing one another, though they hate one another; He merely kills one group of men over another; He keeps peace in one village by making war on another. Hence “peacekeeper missiles.” But peacemakers have to do some real work, and actually are creative in their peace. They may endure unpeace to promote and grow peace, but their peace is pure and even lasting. 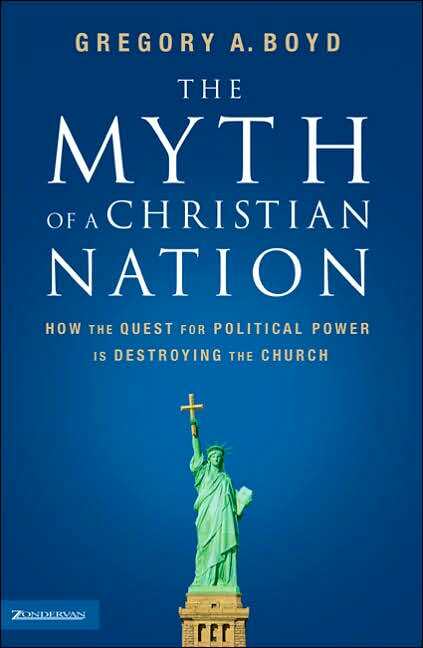 For a further elaboration on the myth of a Christian Nation, you can read Boyd’s book, which I highly recommend. It will be very challenging to a lot of people, but he argues from scripture. I hope that you will come to understand as I have that as a Christian this nation is not my nation, nor is it Christ’s. It is just another kingdom under the rule of Shaitan because it has rebelled and chosen that man rule himself. This nation was created by men who chose to rebel with violence against a government that saw itself as Christian. Therefore, not even its beginnings/roots/origin is truly Christian. So either we say that America is a Christian nation (in a covenantal sense, not just population-wise), in which case she must always turn the other cheek to those who hurt her, or we acknowledge that America is a kingdom of the earth, yet another Babylon, yet another Rome, and is not under a covenant with God, a nation that will inevitably pursue a path of violence to lord over the world, a nation that we can still nonetheless influence towards peace with our light—that is, if we don’t succumb to her temptations and endorse her empire. Which will it be, then? What voices have argued to you that America is a Christian Nation? Do you believe them, and why? What did they offer as evidence that America was especially exempt from the revelation by Christ that all the kingdoms of the world are different from God? Has your understanding of the concepts of church and state and their relation to one another been shaped by the scriptures? Or by a particular cultural heritage’s choice of interpretation of the U.S. Constitution? How comfortable are you with Boyd’s conclusions? In chapter 9 we will look at what Romans 13-14 has to say about this whole government thing. But the next chapter will address violence in the Old Testament. This entry was posted in Books, Faith, Peace and tagged america, Christ, church, constitution, enemies, fight, Greg Boyd, myth, Myth of a Christian Nation, pacifism, peace, satan, state, turn the other cheek, U.S., US, Violence, war, world. Bookmark the permalink.